Stephen Farrelly (Irish: Stíofán Ó Fearghaile) (born 28 January 1978) is an Irish professional wrestler and actor, best known by his ring name Sheamus, /ˈʃeɪməs/. He is signed with WWE and competes on the Raw program, currently tag teaming with Cesaro, where they are former 2 time Raw Tag Team Champions. Prior to joining WWE, Farrelly was also a two-time International Heavyweight Champion during his tenure in Irish Whip Wrestling. He is a three-time World Champion, having held the WWE Championship on two occasions and is the current World Heavyweight Champion in his first reign. He also won the King of the Ring in 2010 and the Royal Rumble in 2012, as well as the WWE United States Championship once. Farrelly was born in Cabra, Dublin and was raised within the city. His father, Mark, was an amateur bodybuilder. Farrelly speaks fluent Gaelic, having attended Scoil Caoimhin Primary and Secondary School, a Gaelscoil During his school years he sang in the Palestrina Choir until the age of thirteen, as part of which he appeared on the Late Late Show and Live at Three television programmes. He played Gaelic football for the Erin's Isle team where he was declared sports star of the month. He also played rugby for the National College of Ireland, where he gained a National Diploma. Farrelly is a former IT technician. He also worked as security for a nightclub which led to him occasionally working personal security for Bono and Larry Mullen Jr. of U2 as well as Denise van Outen. Farrelly's inspiration into a professional wrestling career came from watching both British wrestling from ITV's World of Sport and American wrestling from the World Wrestling Federation on Sky One. On the advice of Bret Hart, Farrelly began training in Larry Sharpe's Monster Factory wrestling school in April 2002, alongside Tank Toland, Cliff Compton and Cindy Rogers. Six weeks later he officially debuted as a fan favorite under the name Sheamus O'Shaunessy against Robert Pigeon. It was during this time that he developed the nickname the "Irish Curse" after low-blowing an opponent. He soon suffered a serious neck injury after botching a hip toss which sidetracked his career for two years. Farrelly soon developed his wrestling character by drawing on Celtic mythology. Wanting to move away from limiting Irish stereotypes of lucky charms, leprechauns and alcoholism, he instead wanted to portray an Irish warrior. Going to a Gaelscoil, Farelly grew up aware of the four cycles of Irish mythology and, inspired by the artwork of Jim Fitzpatrick, incorporated the sword and axe-wielding imagery into his gimmick. This included the design of his own pendant, the crossos, which combines the Celtic cross with a Celtic War sword to illustrate his character's "indigenous origins with a hybrid of warrior strength matched with a strong ethical centre." Sheamus O'Shaunessy after retaining the IwW International Heavyweight Championship on November 14, 2005. In May 2004, still using the ring name Sheamus O'Shaunessy, Farrelly returned to wrestling at the newly opened Irish Whip Wrestling (IWW) school in Dublin. He then made his debut match for the promotion at their Mount Temple show on 9 July against Mark Burns, who he easily defeated. He went on to win a battle royal the following month. O'Shaunessy spent the rest of the year engaged in a rivalry with Vid Vain after losing to his tag team partner Joey Cabray the same night as winning the battle royal. On 22 and 23 October they traded wins, leading to O'Shaunessy recruiting help from CJ Summers to help defeat the tag team on 24 October. Still O'Shaunessy failed to defeat Vain in singles action the following day.Despite these losses, his impressive showings earned him a place against Alex Shane in a guest match for the Frontier Wrestling Alliance (FWA) British Heavyweight Championship. Despite putting on a strong showing and being close to winning, his friend Red Vinny interfered in the match and cost him the championship. In March 2005 he avenged this loss by teaming with Raven to defeat Shane and Vinny. This victory was part of a winning streak over the end of March where O'Shaunessy wrestled twice a day on 24, 25, 26 – including an 11 man Rumble win – and 27 March with a standard tag match and a ten-man tag team match. This series of victories, aside from one loss by disqualification to Vain, put him good stead for the one-day tournament held in County Kildare to crown the inaugural IWW International Heavyweight Champion. On March 28, O'Shaunessy put an end to his main rivalries when he defeated Vinny and then Vain in the quarter and semi finals, respectively. He met Darren Burridge in the final match and won to become IWW's first champion, but had to compete again in an evening show in Dublin, defeating Burridge and Vinny once more in a tag match alongside Vain. O'Shaunessy's first successful title defence came against Burridge the following month but Burridge would not let his grudge rest, continuing to attack O'Shaunessy and finally costing him the title during a match against D'Lo Brown on 29 May. O'Shaunessy earned revenge in July by defeating Burridge in a grudge match, though lost to him in an arm wrestling contest the following day. Still, he continued on his quest to regain the title by winning a contendership three way match against Vinny and Red Viper in August setting him up to regain the International Heavyweight Championship in October from Brown in Newcastle upon Tyne in England. After defending his title against Vampiro O'Shaunessy found himself embroiled in a new feud with rising Scottish wrestling star "Thee" Drew Galloway, whom he later admitted was his toughest opponent. On 28 January 2006, he received his first championship match, evolving their rivalry from previous non-title contests. The rivalry quickly took on a patriotic flavour, with Galloway's blue colours of Scotland clashing O'Shaunnesy's green colours of Ireland, mirroring the Old Firm football derby between Glasgow Rangers and Glasgow Celtic, respectively. This football allusion became particularly prominent when the two met again at Verona Football Club once again for the title, though the match changed into a Lumberjack match, the result and champion remained the same. With Galloway defeated, O'Shaunessy continued to dominate by again defending his title against Vampiro on 17 March. Galloway earned himself a two out of three falls match against the champion the following day, however, which O'Shaunessy won two falls to one; the next day produced the same result in a match O'Shaunessy claimed was his best on the independent circuit. With Galloway briefly answered, O'Shaunessy took on the newcomer Pierre Marcaeu and defeated him in two successive title matches only to find Galloway had earned another shot. With their rivalry intensifying, Galloway's next challenge to O'Shaunnesy was given the stipulation of a Last Man Standing match. O'Shaunessy retained the title, as he also did in June with the same stipulation. Finally, on 28 August, O'Shaunessy lost the IwW International Heavyweight Championship in a singles match to Galloway in what would be his last appearance with the promotion. As well as wrestling in Ireland, O'Shaunessy occasionally travelled to Great Britain to make appearances on the British independent circuit. In April 2006 he was brought into Wales' Celtic Wrestling promotion as a contender for their top title but was defeated by the champion, Chris Recall. Later that year in November, he was employed by London's LDN Wrestling to appear on their Capital TV show where, after quickly defeating William Hill, he gained an LDN Championship match against Tex Benedict which ended with Benedict winning by disqualification and O'Shaunessy attacking him after the match. During his time overseas he worked for Brian Dixon's All Star Wrestling, which gave him a taste of large audiences that he had not experienced in Ireland, as well as wrestling English veteran Robbie Brookside and other British wrestling luminaries, including Nigel McGuinness and Doug Williams. He also represented the UK in a Battle of the Nations tag team match between the UK and Austria alongside Drew McDonald and The Celtic Warrior in a losing effort against Chris Raaber, Michael Kovac & Robert Ray Kreuzer at the European Wrestlng Association's Night of Gladiators. As well as making top contender appearances based on his growing reputation, O'Shaunessy also brought with him to Britain his long-standing rivalry with Galloway. He had already wrestled in Galloway's home promotion, British Championship Wrestling (BCW), twice in 2005 losing to Jay Phoenix on the day before Phoenix would lose to Galloway in March, and returning in September to defeat one of BCW's top stars, Wolfgang, via countout. In the middle of their IWW feud the following year, O'Shaunessy went back to Scotland to take part in BCW's Path To Glory tour, defeating Galloway on the first night but conceding a loss the to him next night in May. Though their feud finished in Ireland in August 2006, it continued on across the Irish Sea when the two wrestled for the umbrella promotion Real Quality Wrestling (RQW) the following year. The two first met during April's Taking On The World show which ended in a double countout. The lack of a decision led to a rematch in June, and one of O'Shaunessy's last on the independent circuit, where Galloway picked up the victory in a No Holds Barred match ahead of an RQW Heavyweight Championship match. On 13 November 2006, O'Shaunessy appeared on the World Wrestling Entertainment (WWE) show Raw at the Manchester Evening News Arena as part of the security team ejecting D-Generation X from ringside only to later receive a Pedigree from Triple H. The following day he and Galloway had a try out match against each other. The following year in April he received another set of try out matches in Milan and London against Galloway as well as Stu Sanders and WWE talent Jimmy Wang Yang and Monster Factory alumnus Domino. This led to an offer for signing a developmental contract for WWE from renowned trainer at which point he relocated to the United States. Sheamus lost the Florida Heavyweight Championship to Eric Escobar, who is seen here in an armbar. O'Shaunessy debuted for the WWE developmental territory Florida Championship Wrestling (FCW) on 2 October in a double-debut match with a win over Bryan Kelly. While wrestling regularly, he was not part of any long feuds but did wrestle with a number of short-term tag teams alongside Hade Vansen and Jake Hager before teaming with Kafu (and managed by Dave Taylor) in the tournament to crown the inaugural FCW Florida Tag Team Champions. They advanced past the first round after defeating The British Lions ("Thee Superstar" Christopher Gray and "The Rascal" Tommy Taylor) but lost to Brad Allen and Nick Nemeth in the second round. By September, O'Shaunessy had focused his attention to singles competition and wrestled his way to the top of the card, successfully defeating former partner Hager for the Florida Heavyweight Championship. He defended the title against Hager on 23 October and took on a number of competitors, with Eric Escobar and Joe Hennig consistently earning themselves into contention. Eventually, on 11 December, O'Shaunessy lost the title to Escobar in a four-way match also involving Hennig and Drew McIntyre (formerly Drew Galloway). O'Shaunessy spent 2009 continuing to chase gold, earning two shots over January and February at the Florida Tag Team Champions Johnny Curtis and Tyler Reks but he and Ryback were unsuccessful in both attempts. In March he challenged the two for the titles once again, this time with McIntyre as his partner but could not defeat them, nor could he defeat McIntyre for the Florida Heavyweight Championship the following month. He received a series of chances throughout the rest of the year but could not win any more titles before being called up to WWE television, unsuccessfully challenging Justin Angel for the Florida Heavyweight Championship in November. On 22 July 2008 O'Shaunessy worked a dark match at a SmackDown taping, losing to R-Truth. The following year in May, O'Shaunessy began appearing at the Raw brand's house shows, and on both 8 and 9 May he defeated Jamie Noble along with another dark match victory over Noble before an episode of Raw. Sheamus as WWE Champion in 2010. On the 30 June 2009 episode of ECW, Farrelly made his unannounced debut as a villain under the shortened ring name of Sheamus, quickly defeating a local competitor. Sheamus soon entered into a critically well-received rivalry with Goldust after defeating him on 29 July. After exchanging victories in the following weeks the two appeared on the Abraham Washington Show talk segment leading to a No Disqualification match on 1 September which was won by Sheamus. Sheamus then began a feud with Shelton Benjamin which was hot-shot into a deciding match on 27 October which Sheamus won. His rivalry with Benjamin ended prematurely because Sheamus had already been moved to the Raw brand. He made his Raw debut by defeating Jamie Noble on 26 October. In the following weeks, he continued to attack Noble causing him to retire, and, in lieu of competition, assaulted the timekeeper and commentator Jerry Lawler on November 16 at Madison Square Garden. The following week Sheamus appeared on his first WWE pay-per-view event, Survivor Series. Sheamus appeared as part of The Miz's team in a traditional five-on-five elimination tag team match. He eliminated fellow Irishman Finlay and made the final pinfall to eliminate the opposing captain John Morrison and survive along with Miz and long-time former rival Drew McIntyre. The following night on Raw, Sheamus won a "break-through" battle royal for wrestlers who had never won a world championship, to become the number one contender to John Cena's WWE Championship. At the contract signing immediately afterwards, Sheamus put Cena through the table as the Raw guest host Jesse Ventura announced it would be a Table match. On 13 December, at the TLC: Tables, Ladders & Chairs pay-per-view, Sheamus defeated Cena to win the WWE Championship, his first championship in WWE, making him the first Irish-born WWE Champion. The following night on Raw, Sheamus was awarded the 2009 Breakout Superstar of the Year Slammy Award. On 31 January at the Royal Rumble, Sheamus retained the his title against Randy Orton via disqualification after he was attacked by Cody Rhodes. On 21 February, Sheamus lost the WWE Championship at the Elimination Chamber pay-per-view in the Elimination Chamber match after he was eliminated by Triple H. During the match, Sheamus suffered a concussion and as a result did not attend Raw the following night. Upon his return, he took revenge on Triple H with an attack to set up a match at WrestleMania XXVI that Sheamus lost. The following month at Extreme Rules, Sheamus attacked Triple H at the beginning of the show and later defeated him in a Street Fight. After a series of kicks to the head to win, he continued his assault after the match finished resulting in Triple H being written off television for ten months. 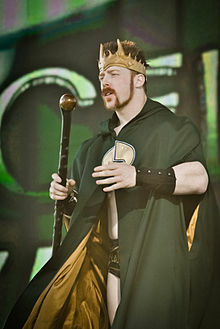 Sheamus as the 2010 King of the Ring. On 20 June, at the Fatal 4-Way pay-per-view, Sheamus won a fatal four-way match, following interference from The Nexus that allowed him to pin John Cena, thus winning the WWE Championship, and beginning his second World Championship reign. He went on to defeat Cena a third time in a steel cage match to retain the championship at the WWE Money in the Bank pay-per-view, and against Randy Orton at SummerSlam, which ended in disqualification, meaning that Sheamus retained his title. At Night of Champions, Sheamus was pinned by Randy Orton in a Six-Pack Elimination Challenge for the WWE Championship. He bounced back on 29 November, with wins over Kofi Kingston and John Morrison to become King of the Ring, after receiving a bye through the second round. As King Sheamus, he faced Morrison again at the TLC: Tables, Ladders and Chairs PPV for a future WWE Championship match but lost the Ladder match. Going into 2011, he continued to lose to Morrison in a mixture of singles and tag team matches. Triple H returned on 28 February and took revenge for his scripted ten month injury by putting him through the announce table. Right after that, Sheamus was defeated by Evan Bourne who returned to Raw after a four month injury. On 7 March, after losing a match against Daniel Bryan, Sheamus challenged him to a rematch with his WWE career on the line against Bryan's United States Championship. He won his match against Bryan the following week, winning his first United States Title. The rematch between Sheamus and Bryan took place on 3 April, during the preshow of WrestleMania XXVII, and ended in a draw after interference from the lumberjacks. In the 2011 Supplemental Draft, Sheamus was drafted to the SmackDown brand. Although he took the United States Championship with him, he lost it back to the Raw brand at Extreme Rules when Kofi Kingston defeated him in a Table match. On the 3 June episode of SmackDown, Sheamus lost a World Heavyweight Championship match to Randy Orton due to biased refereeing from Christian, beginning a turn from a villainous character to a fan favorite over the following weeks. Two weeks later, he was put in a match against Christian with a stipulation that if Sheamus won, he would be able to compete in the World Heavyweight Championship match at WWE Capitol Punishment. However he was unsuccessful in the match, and was he was punted by Randy Orton after the match. Sheamus' face turn culminated in him attacking Mark Henry for being a bully, though he lost to him by count-out at Summerslam. After this loss, Sheamus went on a 14 match winning streak that ended after outside interference from Christian, with whom he had been feuding. During this time, Sheamus defeated Christian in three consecutive matches at Hell in a Cell, Vengeance, and on Smackdown. He then went on a 12 match winning streak building towards winning the 2012 Royal Rumble. He entered the match twenty-second and won by last eliminating Chris Jericho to earn a main event championship match at WrestleMania XXVIII. At Elimination Chamber, Sheamus attacked World Heavyweight Champion Daniel Bryan after the latter retained his title in the Elimination Chamber match; confirming he would face Bryan at WrestleMania. At WrestleMania XXVIII, Sheamus defeated Bryan in eighteen seconds to win his first World Heavyweight Championship. On the 6 April episode of Smackdown, Sheamus was defeated by Alberto Del Rio via disqualification, thus earning Del Rio a future title match. At Extreme Rules, Sheamus successfully defended the World Heavyweight Championship against Bryan in a two out of three falls match. At Over the Limit, Sheamus defeated Randy Orton, Chris Jericho, and Alberto Del Rio in a fatal-four-way match to retain the World Heavyweight Championship. At No Way Out, Sheamus defeated Dolph Ziggler to again retain the World Heavyweight Championship. After losing the WWE World Championship to Roman Reigns, Sheamus would go to tag team with Cesaro and win the Raw Tag Team Championships, before losing them to Karl Anderson and Luke Gallows. Farrelly played the role of Two Ton in the 2008 movie The Escapist, which starred Joseph Fiennes and Brian Cox. He had a small role in the 2006 Irish film, 3 Crosses, and was a Celtic Warrior Zombie in the opening sequence of the 2009 movie Assault of Darkness opposite Vinnie Jones. He appeared on several episodes of the famous Irish sock puppet, Dustin the Turkey's show Dustin's Daily News where he had a rivalry with Dustin. It ended with Dustin and Sheamus having a "fight", which Dustin won. He also appeared on The Podge and Rodge Show as a leprechaun wrestler, along with IWW alumnus George McFly. Sheamus performing the Brogue Kick on Randy Orton. Sheamus as World Heavyweight Champion. ↑ 1.00 1.01 1.02 1.03 1.04 1.05 1.06 1.07 1.08 1.09 1.10 Kamchen, Richard. "Sheamus". Slam! Sports. Canadian Online Explorer. Retrieved 2009-10-06. ↑ McGoldrick, Debbie (2010-03-24). "Sheamus set to take on Triple H at WWE Wrestlemania". Irish Central. p. 2. Retrieved 2010-04-26. ↑ 3.0 3.1 Caldwell, James (2009-06-30). "ECW TV Report 6/30: Ongoing "virtual time" coverage of Dreamer & Christian vs. Kozlov & Regal". Pro Wrestling Torch. Retrieved 2010-01-27. ↑ 4.0 4.1 Sibley, Adam (2007-05-24). "Brits Abroad". The Sun. Retrieved 2009-12-09. ↑ 5.0 5.1 5.2 5.3 5.4 5.5 5.6 "Sheamus Biography". WWE. Retrieved 2011-06-06. ↑ 6.0 6.1 6.2 6.3 6.4 6.5 6.6 "The Celtic Wrestler's Biography". SOS Official. Retrieved 2010-01-27. ↑ 7.0 7.1 7.2 7.3 7.4 McDonnell, Kevin (2006-05-07). "Sheamus Out to Slam 'em". Daily Mirror. Find Articles. Retrieved 2008-10-25. ↑ 10.0 10.1 10.2 10.3 10.4 10.5 Porter, Christopher (2009-12-10). "Tables, Ladders & Sheamus: The WWE's Celtic Warrior". Express Night Out. Express. Archived from the original on 2009-12-15. Retrieved 2012-01-26. ↑ 11.0 11.1 Murphy, Hubert (2009-11-28). "Sheamus wrestles his way to the top". Fingal Independent. Retrieved 2010-01-27. ↑ 12.00 12.01 12.02 12.03 12.04 12.05 12.06 12.07 12.08 12.09 12.10 Denton, James (November 2006). "Fighting Spirit Magazine Interview". Fighting Spirit Magazine. SOS Official. Retrieved 2010-01-24. ↑ "Sarsfield, Lucan, County Dublin 02/12/04". Irish Whip Wrestling. Archived from the original on 2008-04-15. Retrieved 2010-01-24. ↑ "The Moat Theatre, Naas, County Kildare 23/07/05". Irish Whip Wrestling. Archived from the original on 2008-04-15. Retrieved 2010-01-24. ↑ 16.0 16.1 16.2 "Sheamus OShaunessy". Big Time Wrestling. Retrieved 2010-01-10. ↑ "Stillorgan, Dublin 28/01/06". Irish Whip Wrestling. Archived from the original on 2007-02-28. Retrieved 2009-12-10. ↑ Bullgod, The. "IwW promoter on WWE Superstar Drew McIntyre". Wrestler Ramblings. Retrieved 2009-12-09. ↑ "Verona Football Club, Blanchardstown, Co. Dublin 19/02/06". Irish Whip Wrestling. Archived from the original on 2006-05-30. Retrieved 2009-12-10. ↑ "IwW Gym, Baldoyle Industrial Estate, County Dublin 17/03/06". Irish Whip Wrestling. Archived from the original on 2006-05-30. Retrieved 2009-12-10. ↑ "St.Finbarr's GAA Club, Cabra, Dublin 18/03/06". Irish Whip Wrestling. Archived from the original on 2006-05-30. Retrieved 2009-12-10. ↑ "Skerries Community Centre, Skerries, Dublin 19/03/06". Irish Whip Wrestling. Archived from the original on 2006-05-30. Retrieved 2009-12-10. ↑ "Clonmel GAA Centre, Clonmel, Co. Tipperary 23/04/06". Irish Whip Wrestling. Archived from the original on 2006-05-30. Retrieved 2009-12-10. ↑ "Community Centre, Rathdowney, Co. Laois 26/04/06". Irish Whip Wrestling. Archived from the original on 2006-05-30. Retrieved 2009-12-10. ↑ "M.C.R. Community Centre, Sligo Town, County Sligo 27/04/06". Irish Whip Wrestling. Archived from the original on 2006-05-30. Retrieved 2009-12-10. ↑ "Celtic Wrestling – Results 2006". Celtic Wrestling. Retrieved 2010-01-27. ↑ "LDN Anniversary Showdown Results". LDN Wrestling. 2006-11-22. Archived from the original on 2007-10-25. Retrieved 2010-01-27. ↑ Plummer, Russell (2006-07-14). "All Star Grapplevine presented by Russell Plummer". All Star Wrestling. Retrieved 2010-01-27. ↑ "EWA Results". European Wrestling Association. Retrieved 2010-01-27. ↑ "April 20th Live Event Results". Real Quality Wrestling. Archived from the original on 2007-08-22. Retrieved 2009-12-10. ↑ "June 16th Live Event Results". Real Quality Wrestling. Archived from the original on 2007-08-22. Retrieved 2009-12-10. ↑ Plummer, Dale (2006-11-14). "Raw: DX have a jolly ol' time in England". Slam! Sports. Canadian Online Explorer. Retrieved 2010-01-27. ↑ "Upcoming and Past Fights". SOS Official. Retrieved 2010-01-27. ↑ "FCW Results 2007". Online World of Wrestling. Retrieved 2010-01-27. ↑ 35.0 35.1 "FCW Results 2008". Online World of Wrestling. Retrieved 2010-01-27. ↑ "FCW Results 2009". Online World of Wrestling. Retrieved 2010-01-27. ↑ Endres, Cody (2010-02-18). "FCW TV Report 11/1: WWE developmental TV – Sheamus vs. FCW Hvt. champion Justin Angel (NXT star), Curt Hawkins vs. DiBiase, Caylen Croft vs. Rotundo". Pro Wrestling Torch. Retrieved 2010-02-18. ↑ Begley, Ray (2008-07-22). "Smackdown spoilers from Philadelphia". Wrestling Observer/Figure Four Online. Retrieved 2008-10-25. ↑ Martin, Adam (2009-05-10). "5/8 WWE Results: Erie, PA". WrestleView. Retrieved 2009-05-10. ↑ Martin, Adam (2009-05-10). "5/9 WWE Results: Youngstown, OH". WrestleView. Retrieved 2009-05-10. ↑ Aldren, Mike (2009-05-12). "Daily wrestling news and gossip". The Sun. Retrieved 2009-05-12. ↑ 42.0 42.1 "Florida Championship Wrestling, I mean ECW, TV report". Wrestling Observer/Figure Four Online. 2009-06-30. Retrieved 2009-07-01. ↑ 43.0 43.1 Mezzera, Jon (2009-09-02). "9/1 WWE ECW Hits & Misses: Abraham Washington Show, Benjamin vs. Ryder, Goldust vs. Shaemus". Pro Wrestling Torch. Retrieved 2010-01-27. ↑ 44.0 44.1 Bishop, Matt (2009-07-29). "ECW: Ryder pushes Christian to the brink". Slam! Sports. Canadian Online Explorer. Retrieved 2010-01-27. ↑ Johnson, Matt (2009-08-13). "Superstars: Goldust leads rookie to his best match on television". Slam! Sports. Canadian Online Explorer. Retrieved 2010-01-27. ↑ Mayer, Dominick (2009-08-18). "8/18 ECW on SyFy Report: Mayer's alt. perspective review of Regal's New Faction, Hurricane's in-ring return, Washington hosting Goldust and Sheamus". Pro Wrestling Torch. Retrieved 2010-01-27. ↑ Mezzera, Jon (2009-10-28). "10/27 WWE ECW Hits & Misses: Abraham Washington Show, Shaemus vs. Benjamin, Christian vs. Tatsu". Pro Wrestling Torch. Retrieved 2010-01-27. ↑ Plummer, Dale (2009-10-27). "Raw: Superstars take revenge on Big Show". Slam! Sports. Canadian Online Explorer. Retrieved 2009-10-27. ↑ "Jamie Noble retires". World Wrestling Entertainment. 2009-11-09. Retrieved 2010-01-27. ↑ Writer X (2009-11-17). "Raw: Smaller set, big three-way tag match at MSG". Slam! Sports. Canadian Online Explorer. Retrieved 2010-01-27. ↑ McNichol, Rob (2009-11-25). "Sheamus set for WWE big time". The Sun. Retrieved 2010-01-24. ↑ Caldwell, James (2009-12-13). "WWE TLC PPV Report 12/13: Complete PPV report on Cena vs. Sheamus, DX vs. JeriShow, Taker vs. Batista". Pro Wrestling Torch. Retrieved 2009-12-14. ↑ 53.0 53.1 "2009 Slammy Awards". World Wrestling Entertainment. 2009-12-14. Retrieved 2009-12-15. ↑ Plummer, Dale; Tylwalk, Nick (February 1, 2010). "The 2010 Royal Rumble is Rated R in Atlanta". Slam! Sports. Canadian Online Explorer. Retrieved March 3, 2010. ↑ Caldwell, James (2010-02-21). "WWE Elimination Chamber PPV Results 2/21: Ongoing "virtual time" coverage of live event". Pro Wrestling Torch. Retrieved 2010-02-24. ↑ Deitch, Charlie (2 December 2010). "Heavyweight Champions". Pittsburgh City Paper. Retrieved 3 December 2010. ↑ Martin, Adam (2010-02-23). "Report: Sheamus suffers concussion". WrestleView. Retrieved 2010-02-27. ↑ Plummer, Dale (2010-03-01). "RAW: A bad trip on the Road to Wrestlemania". Slam! Sports. Canadian Online Explorer. Retrieved 2010-03-29. ↑ Martin, Adam (2010-03-28). "Wrestlemania 26 Results – 3/28/10". WrestleView. Retrieved 2010-03-29. ↑ Kapur, Bob (2010-04-25). "WWE Extreme Rules features strong Mania rematches". Slam! Sports. Canadian Online Explorer. Retrieved 2011-03-26. ↑ Caldwell, James (2010-06-20). "WWE News: Fatal Four-Way PPV News & Notes – three new champions, bonus matches, Vince McMahon appearance". Pro Wrestling Torch. Retrieved 2010-06-21. ↑ "History of the WWE Championship: Sheamus (2)". World Wrestling Entertainment. 2010-06-20. Retrieved 2010-06-21. ↑ Adkins, Greg (2010-07-18). "Bank robbery". World Wrestling Entertainment. Retrieved 2010-07-21. ↑ Tylwalk, Nick (2010-09-20). "Few gimmicks, more title changes at Night of Champions". Slam! Sports. Canadian Online Explorer. Retrieved 2010-09-25. ↑ Plummer, Dale (2010-11-29). "Raw: King of the Ring crowned". Slam! Sports. Canadian Online Explorer. Retrieved 2010-11-30. ↑ Caldwell, James (2011-12-19). "WWE TLC PPV Results 12/19: In-person "virtual-time" coverage of TLC PPV – off-air PPV notes, Miz vs. Orton, Cena vs. Barrett". Pro Wrestling Torch. Retrieved 2011-03-25. ↑ Plummer, Dale (2010-12-21). "Raw: No Nexus, no problem". Slam! Sports. Canadian Online Explorer. Retrieved 2011-03-25. ↑ Plummer, Dale (2011-01-10). "Raw: CM Punk thins out the ranks". Slam! Sports. Canadian Online Explorer. Retrieved 2011-03-26. ↑ Plummer, Dale (2011-02-28). "Triple H talks Wrestlemania; The Miz loses an ally". Slam! Sports. Canadian Online Explorer. Retrieved 2011-03-26. ↑ Gerweck, Steve. "Sheamus no longer "King Sheamus"". Wrestleview. Retrieved 2011-06-07. ↑ Caldwell, James (2011-03-14). "WWE Raw results 3/14: Complete "virtual time" coverage of live Raw — Cena vs. Del Rio main event, U.S. Title match, two surprise returns, Snooki". Pro Wrestling Torch. Retrieved 2011-03-25. ↑ "Results:The Great Khali won the Over-the-Top-Rope WrestleMania Battle Royal". World Wrestling Entertainment. Retrieved 2011-04-05. ↑ "WWE News: Full list of 2011 WWE Draft Picks (televised Raw Draft & Supplemental Draft)". Pro Wrestling Torch. 2011-04-26. Retrieved 2011-04-27. ↑ "Kofi Kingston def. Sheamus (Tables Match; New United States Champion)". WWE. Retrieved 2011-05-02. ↑ Burdick, Michael. "SmackDown results: Deliberating the dilemma". WWE. Retrieved 5 July 2011. ↑ Burdick, Michael. "SmackDown results: A "Capitol" offense". WWE. Retrieved 5 July 2011. ↑ WWE.com. "Sheamus vs Mark Henry". WWE. Retrieved 9 August 2011. ↑ Burdick, Michael. "Mark Henry def. Sheamus (Count-out)". WWE. Retrieved 16 August 2011. ↑ "Did You Know – Sheamus ends long streak on Smackdown". PWTorch. 15 October 2011. Retrieved 19 October 2011. ↑ Burdick, Michael. "Sheamus defeated Christian at Hell in a Cell". ↑ Burdick, Michael. "Sheamus defeated Christian at Vengeance". ↑ Burdick, Michael. "Sheamus 3–0 to Christian". ↑ "1/16 WWE Raw box score: Snapshot of Monday's show – match times, Win/Loss Records, Titles, Streaks (rough night for Ryder & Sheamus)". Pro Wrestling Torch. TDH Communications. 18 January 2012. Retrieved 16 February 2012. ↑ Caldwell, James. "Caldwell's WWE Royal Rumble report 1/29: Ongoing "virtual time" coverage of live PPV – Rumble match, Punk-Ziggler, Cena-Kane, steel cage". Pro Wrestling Torch. Retrieved 30 January 2012. ↑ Giannini, Alex (February 19, 2012). "Sheamus vs. Daniel Bryan (World Heavyweight Championship)". WWE. Retrieved 19 February 2012. ↑ Alex Giannini (9 April 2012). "World Heavyweight Champion Sheamus vs. Daniel Bryan – 2-out-of-3 Falls Match". WWE. Retrieved 2012-04-11. ↑ "Fatal-4-Way World Heavyweight Championship Match". WWE. Retrieved 2012-05-21. ↑ Artus, Matthew. "World Heavyweight Champion Sheamus def. Dolph Ziggler". WWE. Retrieved June 17, 2012. ↑ "Irish wrestler's big-screen debut". The Irish World. 2008-01-02. Retrieved 2010-01-24. ↑ 91.0 91.1 91.2 Endres, Cody. "FCW report on May 17, 2009". Pro Wrestling Torch. Retrieved 2009-12-15. ↑ 92.0 92.1 Caldwell, James (2009-11-09). "Caldwell's WWE Raw Report 11/9: Ongoing "virtual time" coverage of Ricky Hatton hosting from the U.K." Pro Wrestling Torch. Retrieved 2009-11-11. ↑ "Randy Orton & Sheamus vs. Wade Barrett & Cody Rhodes". WWE. 2011-11-18. Retrieved 2012-06-06. Sheamus drives Rhodes to the canvas with a Celtic Cross. ↑ Caldwell, James (2009-09-01). "Caldwell's ECW TV Report 9/1: Ongoing "virtual time" coverage of The Undertaker vs. Shawn Michaels WM25 and ECW happenings". Pro Wrestling Torch. Retrieved 2009-09-02. ↑ "Sheamus vs Dolph Ziggler photos". WWE. Retrieved 2012-03-12. ↑ Greg, Parks. "PARKS' WWE SMACKDOWN REPORT 2/3: Ongoing "virtual time" coverage of the show, including Randy Orton vs. Wade Barret in a no-DQ match". Pro Wrestling Torch. Retrieved 2012-02-26. ↑ Cupach, Michael. "CUPACH'S WWE SMACKDOWN REPORT 8/26: Alt. perspective review, Mike's Reax to segment & matches". Pro Wrestling Torch. Retrieved 10 October 2011. ↑ Cupach, Michael. "CUPACH'S SMACKDOWN REPORT 5/6: Look-back to last week's Smackdown featuring Randy Orton's World Title win". Pro Wrestling Torch. Retrieved 10 October 2011. ↑ Caldwell, James. "CALDWELL'S WWE NIGHT OF CHAMPIONS PPV RESULTS 9/19: Ongoing "virtual time" coverage of live PPV — Six-Pack Challenge, Kane vs. Taker, Miz vs. Bryan". Pro Wrestling Torch. Retrieved 2011-06-06. ↑ Endres, Cody. "FCW TV REPORT 11/1: WWE developmental TV – Sheamus vs. FCW Hvt. champion Justin Angel (NXT star), Curt Hawkins vs. DiBiase, Caylen Croft vs. Rotundo". Pro Wrestling Torch. Retrieved 2011-06-06. ↑ Tait, James. "TAIT'S WWE SMACKDOWN REPORT 7/15: Complete coverage of final hype for MITB PPV, Christian antagonizes Orton, Tait's Overall Breakdown". PW Torch. Retrieved 16 July 2011. ↑ Parks, Greg. "PARKS' WWE SMACKDOWN REPORT 6/3: Ongoing "virtual time" coverage of the show, including Orton vs. Sheamus for the World Championship". Pro Wrestling Torch. Retrieved 2011-06-06. ↑ Keller, Wade. "KELLER'S WWE ELIMINATION CHAMBER PPV REPORT 2/20: Ongoing "virtual time" coverage of live event with WrestleMania ramifications". Pro Wrestling Torch. Retrieved 2011-06-06. ↑ Tait, James. "TAIT'S WWE SMACKDOWN REPORT 5/6: Alt. perspective review of Christian's one week as champion, Overall Show Break Down". Pro Wrestling Torch. Retrieved 2011-06-06. ↑ Caldwell, James. "CALDWELL'S WWE RAW REPORT 11/9: Ongoing "virtual time" coverage of Ricky Hatton hosting from the U.K." Pro Wrestling Torch. Retrieved 2011-06-06. ↑ Cupach, Michael. "CUPACH'S SMACKDOWN REPORT 5/6: Look-back to last week's Smackdown featuring Randy Orton's World Title win". Pro Wrestling Torch. Retrieved 2011-06-06. ↑ Cupach, Mike. "CUPACH'S SMACKDOWN REPORT 5/20: Alt. perspective review of final PPV hype, Mike's Reax on overall show". Pro Wrestling Torch. Retrieved 2011-06-06. ↑ Trionfo, Richard. "WWE SmackDown Report: The Viper returns and he brought gifts; how long before Natalya wrestles Brodus Clay? ;Drew is still here...but for how long?". PWInsider. Retrieved 30 January 2012. ↑ "Sheamus O'Shaunessy". Online World of Wrestling. Retrieved 2009-07-16. ↑ "What does Sheamus think of the "Great White" nickname?, why he's not on Twitter". Pro Wrestling Torch. Retrieved 30 December 2011. ↑ "Written in My Face (Legal Title)". Broadcast Music Incorporated. Retrieved 2009-12-15. ↑ "WWE The Music – A New Day, Volume 10 (Amazon MP3 Exclusive)". Amazon.com. Retrieved 2010-01-29. ↑ ""PWI 500": 1–100". Pro Wrestling Illustrated. 2010-07-30. Retrieved 2010-07-31. ↑ "Sheamus' first United States Championship reign". ↑ Caldwell, James (2010-11-29). "Caldwell's WWE Raw Results 11/29: Ongoing "virtual time" coverage of live three-hour Raw – King of the Ring tournament, Miz's first night as WWE champion". Pro Wrestling Torch. Retrieved 2010-11-29. ↑ "Sheamus won the 30-Man Royal Rumble Match". ↑ "WWE News: Full list of 2010 Slammy Awards – 12 announced on Raw, 10 announced on WWE's website". Pro Wrestling Torch. 2010-12-13. Retrieved 2010-12-17. ↑ "Non-televised WWE Slammy Awards". ↑ Meltzer, Dave (January 26, 2011). "Biggest issue of the year: The 2011 Wrestling Observer Newsletter Awards Issue". Wrestling Observer Newsletter (Campbell, CA): 1–40. ISSN 10839593. Wikimedia Commons has media related to Sheamus. This page was last changed on 10 March 2019, at 00:23.